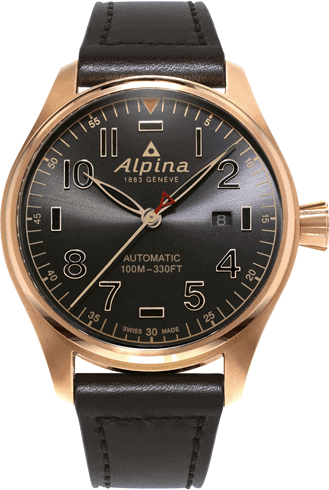 The new Alpina Shadow Line is now available in store declined in six watches: two Startimer Pilot big date quartz chronographs, three Startimer Pilot Automatic watches and an Automatic Alpiner 4 watch, all equipped with an exclusively developed Alpina connected e-strap. 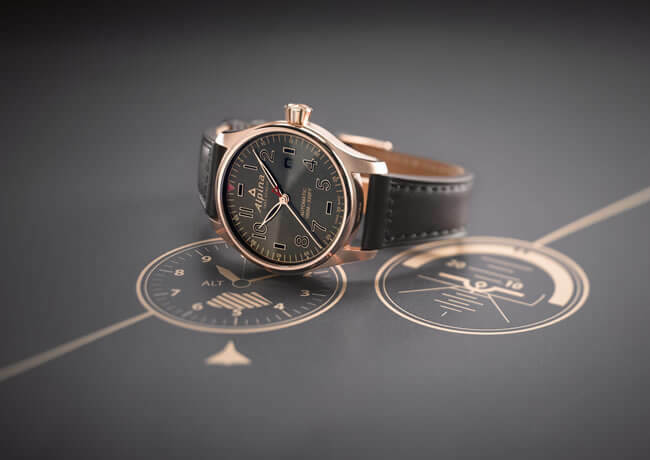 Faithful to Alpina’s roots, a new line of smoked dials combining urban elegance and sporty technicity is born, reinterpreting its best-selling pieces. Drawing inspiration from the Startimer Pilot Automatic collection, these Shadow Line edition timepieces maintain all the desired pilot features as well as excellence and qualitative finishing details with an added twist. A great example of the above would be the rose gold-plated stainless steel 44 mm case contrasting with a dark grey sunray finishing dial, it displays the typical oversized luminous hand-applied rose gold-plated indexes and hands with a date window at 3 o’clock. The timepiece features a dark genuine leather e-strap as well as an engraved case back. Another model is available in black PVD-coated stainless steel with a dark blue or dark grey dial displaying mat finishing and applied pearl black indexes and date window at 3 o’clock. The same models are available with the quartz Chronograph function and bearing the same mat urban sporty look. The Alpiner 4 is one of the most emblematic Swiss sports watches, combining beautiful aesthetics while offering performance and accuracy to alpine and nature enthusiasts under the harshest conditions. 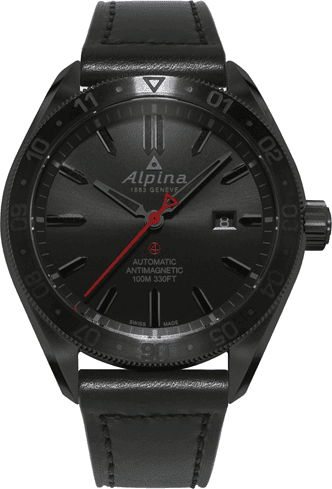 Alpina introduces a new version in black PVD-coated stainless steel with its famous red triangle adorning the seconds hand and the 12 o’clock mark on the bi-directional turning bezel, while the Alpina 1883 logo is engraved on the 44mm back case of the watch. The date window is displayed at 3 o’clock and the luminova-treated indexes are delicately placed over the sunray-finished dial. The AL-525 automatic caliber offers a 38-hour power-reserve, the stainless-steel case allows for a 10 ATM water-resistance as well as the other three main features of the Concept 4 anti-magnetic, anti-shock, and stainless steel. 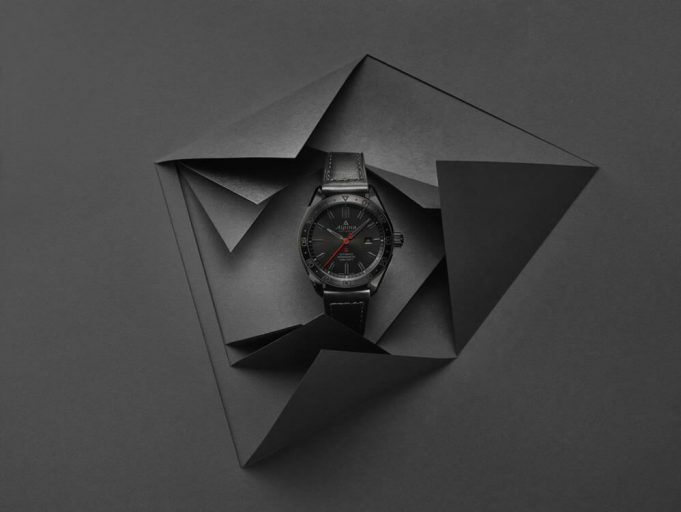 Each watch comes with its own black leather e-strap with a black fiberglass buckle. The Alpina e-strap helps you to track your steps, calories, sleep, and more. The e-strap is an elegant and sporty leather strap with a hidden chip in its buckle that helps you to lead a healthier lifestyle and get tips from its companion app, the MMT-365. The app can be downloaded free of charge on iOS and Android devices and functions with all Alpina Horological smartwatches.